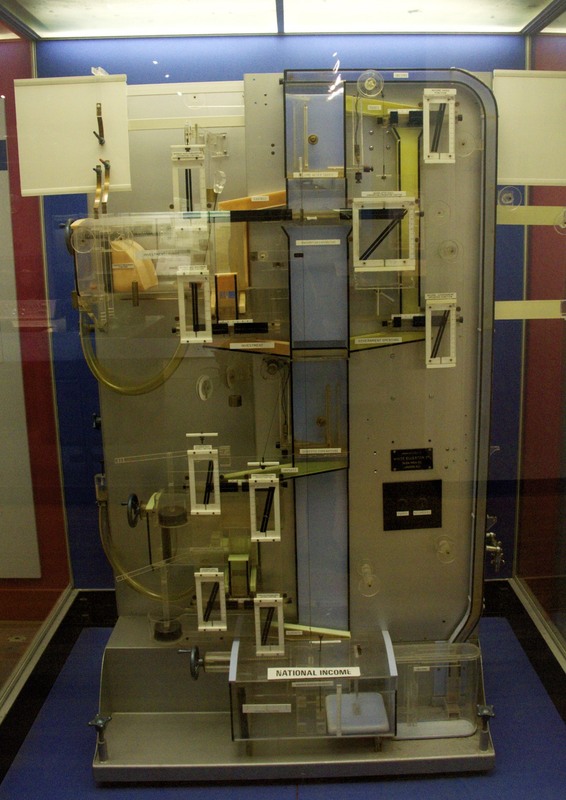 Phillips' Economic "MONIAC Hydraulic Computer"
In absence of electronic computers William Phillips used a hydraulic system to simulate national economy. Only 14 of such machines have been built, and the original design was meant to be a teaching aid. It was called MONIAC (Monetary National Income Analog Computer), and it is quite fascinating to watch. Even without seeing it operated, but just exhibited in the London Science Museum, it explained to me very well the principles and how the different factors of an economy work together. It is a system of tanks, valves and water represents money. The bottom tank is the National Income. Phillips demonstrated the machine to economists in the London School of Economics (LSE) first in 1949. Have a look by clicking here how it works. MONIAC computer exhibited in the Science Museum London (2013). Schematic description of the MONIAC.